It's not surprising that today's Wedding Wednesday giveaway was so popular - we don't blame you because we love Marley Lilly just as much as you do. And really, how could you not be obsessed with the giveaway prize - this super cute, orange monogrammed luxe cross body clutch! One very, very luck lady will be getting one of these chic clutches with a monogram of her choice to call her own. After compiling all of your entries - on our blog, the Twittersphere, in emails and all OVER Marley Lilly's Facebook page...we randomly drew a name and we have a winner!! Brenley, please contact us at clemsongirlblog@gmail.com to claim your fabulous prize!! 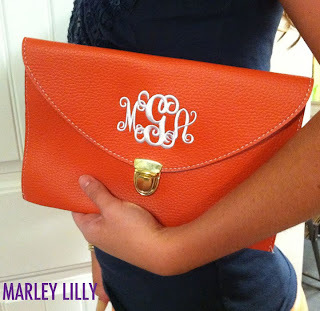 Thanks ladies for all of your entries, and a big, big thanks to Marley Lilly for sponsoring today's giveaway! We are almost past Wednesday and closer to the weekend!